The gaming world was taken a bit by surprise earlier this year when rumors began to swirl regarding a new entry into the much-loved Burnout franchise. Called Burnout Crash!, and first leaked by the Australian ratings board, it seemed like Burnout fans would finally get the proper Crash Mode that Criterion inexplicably left out of the last proper Burnout title, Burnout Paradise. People were hopeful, and then it came to light that it was a downloadable game with a top-down presentation and goofy art style causing much of that hope to be swept away as millions of gamers scratched their heads in confusion. Burnout’s beloved Crash Mode was never what I would call “mature gaming,” however, it’s never been childish either, so it didn’t automatically mean fans were going to be happy with a kiddiefied title that seemed to be aimed at the average Burnout fan’s little brother. Then Kinect compatibility was announced and it seemed that, not only were little brothers a key target demographic, but also grandparents. It was looking pretty bad for Burnout Crash! ; however, having played the game, I can say that I found most of my fears to be completely unwarranted. The truth is that Burnout Crash!, despite its seeming "kidification", is the proper Crash Mode that fans missed in Burnout Paradise. Sure, the camera is top-down rather than behind your vehicle, and it’s bright, and colorful instead of the more subdued and realistic color palette of previous Crash Modes, but that doesn’t make it any less worthy of being treated as an equal to them. It truly is a proper Burnout Crash Mode through and through. The Sound effects, car handling, and need for light strategy to maximize your score are all in place and pretty much identical to the older games. The Crashbreaker returns as well, although it’s been tweaked to fit in with the game’s slightly more arcade-like tone. 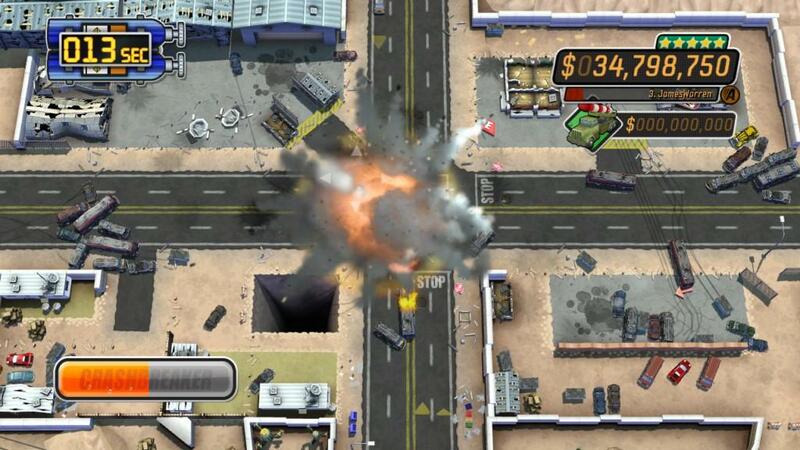 One big change is the inclusion of “skill shots.” Detonating a Crashbreaker will send nearby cars flying and if they, by chance or purposefully, hit other cars, dumpsters (which can also act as Crashbreaker projectiles), or some other specified target, you get a score bonus depending on the length of the skill shot. The one area where it’s not like older Burnout Crash Modes, however, is in the number of crash intersections. I guess the reduced number fits its standing as a downloadable title, rather than full retail, release. 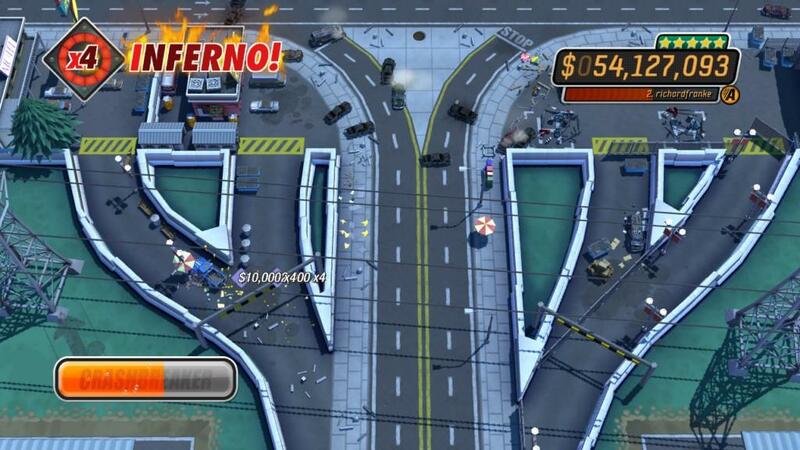 Whereas the older ones had 30 or 40 individually crafted crash intersections, Burnout Crash! has six, with each one having three different courses, from simple two-way perpendicular intersections to roundabouts, divided highways and everything in between. Each of the 18 courses has its own off road paths that require a bit of luck and skill to negotiate, but when you do it, the extra carnage created often helps lead to much higher scores. The crash intersections themselves each have their own theme (airport, beach, college, etc.) that shows itself in the goofiest way possible. These themes are exemplified by the voice of local radio personalities whose job it is to give updates on whatever overriding threat each intersection is facing. Examples include a novice air traffic controller at the airport warning of impending air disasters, an astronomer at the college that sees a meteor heading straight toward your intersection, and a surfer-dude lifeguard at a beach being threatened by a tsunami. 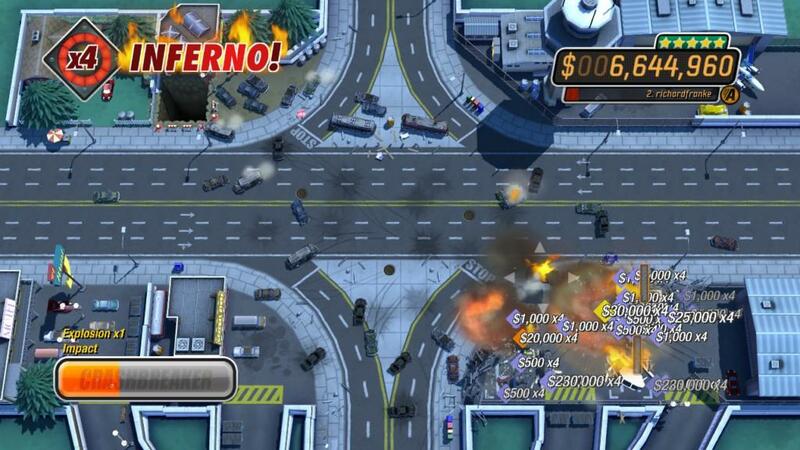 These local disasters are not just for flavor either as they, in fact, serve a gameplay purpose. 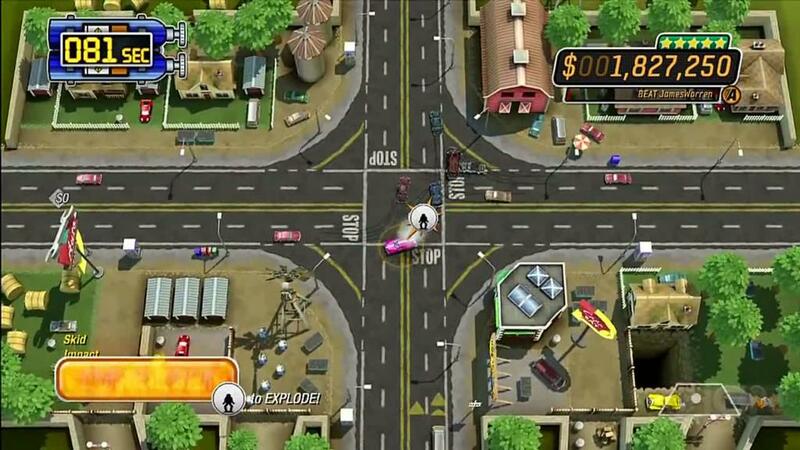 During the game’s main Crash Mode, called Road Trip, a certain number of cars attempt to pass through the intersection and as you crash them, a meter builds up; when you crash the last car, without letting the maximum of five pass unscathed (thereby ending the session prematurely - don‘t worry though, you can clear off up to two by allowing ambulances to pass untouched), you are rewarded with an intersection clearing disaster that acts as a final bonus added to your score. The power of this final disaster is governed by how many cars you let pass the intersection, with each car un-crashed equaling a 20% reduction in power. You don’t have to wait until the end to reap the rewards of your crashing either. Each Road Trip session is divided into three parts, and parts one and two each end with their own smaller reward (the disaster is the reward for part three). These vary by intersection and can range from a tanker truck that, if you crash it, will blow up setting off a chain reaction of explosions (explosion chains add multipliers to your score, so they’re important to set up whenever possible), to a blizzard that freezes all the wrecked cars allowing them to be shattered for bonus points. When it’s over, whether you made it to the end or not, your score is tallied and you’re given a traditional Burnout star ranking. Achieving at least one star in Road Trip unlocks the next course, along with the two other modes available for the course you’re on called Rush Hour and Pile Up. Also after every three crash intersections a larger star “toll” is required to continue. If you’re flying through it, only getting one star in Road Trip before moving on, you’ll find yourself having to go back and grind before you have enough stars to pay the toll. As much fun as Road Trip can be when it’s not suffering from evil and random difficulty spikes based on the particular layout of that particular course (divided highways are evil), I would consider Rush Hour to be my favorite. Rush Hour dispenses with the premature failure and three-part division of Road Trip, instead, giving you 90 seconds to cause as much havoc as possible. And it doesn’t matter if you focus on crashing cars or destroying buildings (yes, there is finally real environmental damage in a Burnout title); although to maximize your score you’ll have to learn to do both. 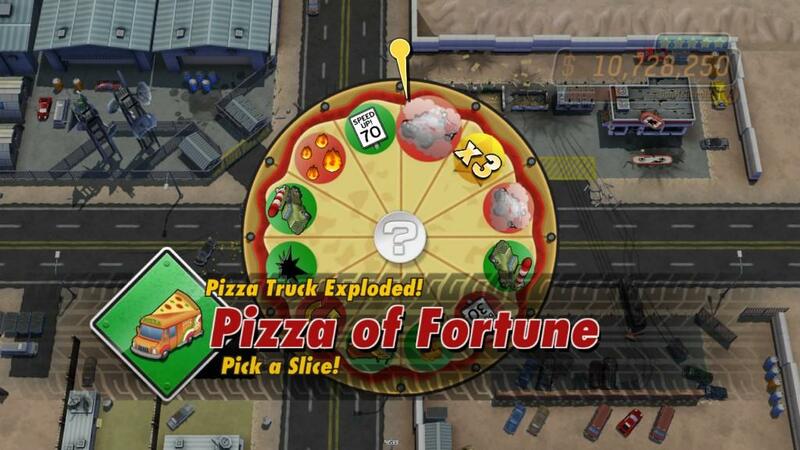 Crash enough cars in Rush Hour and a pizza truck will enter the fray; crashing the pizza truck lets you spin a wheel of reward scenarios. Some add score multipliers, others cause taxis or an armored bank truck to appear that give you money when crashed, while others slow traffic down or fill your screen with fog. Honestly, I was never entirely sure if the game considered those rewards or punishments. 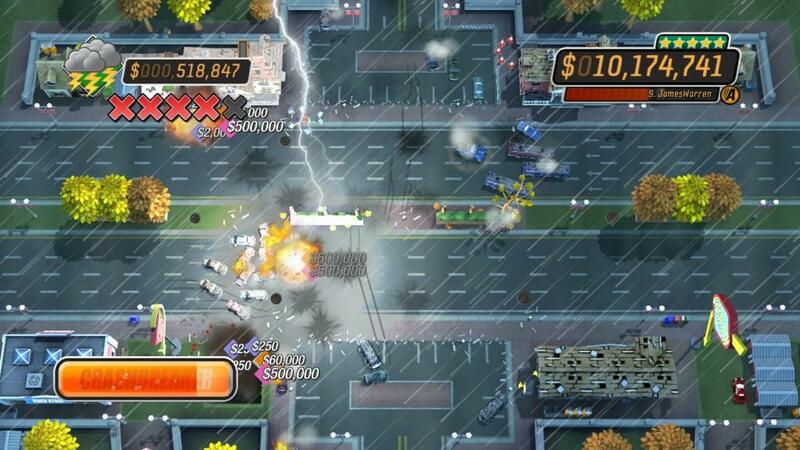 The third mode, called Pile Up gives you a limited supply of traffic. Each car that gets away un-crashed affects your score multiplier. The catch is that this score multiplier doesn’t kick in until after you’ve dealt with all the traffic one way or the other. At that point, you enter a sort of sudden-death mode where you have to set stuff on fire, and keep the fires burning for as long as possible to maximize the score multiplier’s benefit. If the fires go out for too long, the round ends. To me this mode did not live up to the expectations set by the other two. There’s not nearly as much traffic as there seems like there should be and the fires burn out a hair too fast for my liking, also certain objects can’t seem to be set on fire at all, but the game never tells you what they are so it’s easy to run out of time because you tried to ignite something that was never going to burn. Also, if you do too good of a job destroying stuff during the traffic portion, there just won’t be enough material left to set on fire to maximize your score. Detonating your Crashbreaker counts as setting a fire, but if there nothing to burn, it doesn’t matter. Despite all the praise, Burnout Crash! has one giant glaring flaw that just can’t be ignored, however: The almost complete lack of multiplayer. That’s a cardinal sin for a game such as this if you ask me. The bread and butter of those old Burnout games was their multiplayer and Burnout was one of the few titles to offer fully-featured local competitive multiplayer, but none of that is in Burnout Crash!. What it has instead boils down to leader boards that track your scores in relation to your friends. Oh sure, it has the fancy name “Autolog,” and you and your friends can send challenges back and forth, but the only challenge is setting a higher score than they did. You can issue challenges yourself or have the Autolog feature find appropriate challenges for you, but the amount of these challenges is limited by the number of friends you have who own Burnout Crash!. I know EA has become obsessed with leader boards and challenging friends over Xbox Live, some of their recent games seem to focus entirely on that. Burnout Paradise and the last few Tiger Woods games come to mind as purveyors of this style of multiplayer, but it’s silly when it comes at the expense of what I’d imagine most people loved about the older Crash Modes. There is not even matchmaking or anything geared for the kind of competitive multiplayer Xbox Live is known for. All you can ever do is sit alone trying to hit arbitrary score targets set by people you’ve probably only ever interacted with online. The simple joy of outscoring an opponent is diminished when you can’t see the other person or even talk to them in real time. Yeah, I guess you can send them a message, but it will never be the same. I think it’s very telling that Criterion felt the need to add a “find a friend” feature for Burnout Crash! to account for the potentially limited pool of friends to challenge. You should know you’ve done something wrong when you feel the need to add the Xbox Live equivalent of an online dating service just so players can get a proper online experience. Still, I have to say that I enjoyed Burnout Crash. The best racing games are ones where you fail, then tell yourself “just one more try,” and the next thing you know it’s 5am and you haven’t eaten or used the restroom in 12 hours. Burnout Crash! was that kind of game for me. It’s pretty short, an average gamer could clear all 18 courses in an afternoon, but it’s fun, it looks sharp, and almost everything that happens has its own hilarious, and only tangentially appropriate, licensed music track to go along with it. That particular musical aspect gave the game a lot of character. If only Criterion had seen fit to give it a proper multiplayer experience, Burnout Crash! would have completely made up for the lack of a true Crash Mode in Burnout Paradise and could have potentially carved out a reputation as the best Burnout Crash Mode ever. As it stands, however, Burnout Crash! is just a fun game with a cruddy multiplayer concept that diminishes the experience as a whole. The multiplayer is such an incredible failure that if I could give it an “incomplete” instead of a proper grade, I would. Burnout Crash is a proper multiplayer mode away from being most enjoyable downloadable title I’ve ever played. Despite the change to a top-down camera, and silly tone that’s brand new to the series, the rest of the game should be exactly what the doctor ordered for those suffering from Crash Mode withdrawal. And hey, if you have lots of friends who all downloaded Burnout Crash! just like you did, even the Autolog feature that passes for Crash’s multiplayer might seem like less of a stunted feature than it is.